With five bus shelters in place, another being finished and six more planned, the City of Maricopa Express Transit (COMET) system is in a new phase. 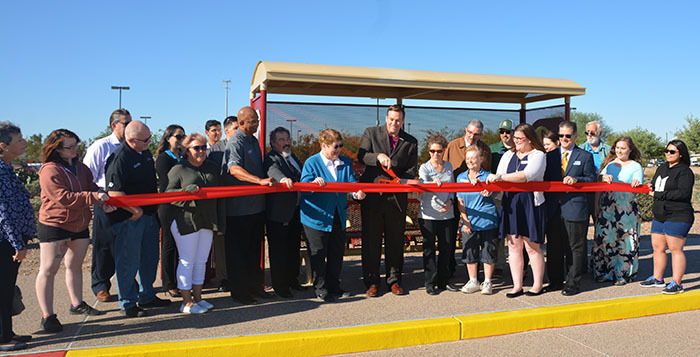 Mayor Christian Price cut the ribbon on a bus stop at the Central Arizona College campus Wednesday morning. “It’s really a great opportunity to find new ways to move people around the city,” Price said, “especially as we move into our retail areas.” He touted the wide array of residents who use the transit system, from students to seniors. Bus shelters are also at Legacy Traditional School, which is across Regent Drive from the college, Fry’s Marketplace, Pacana Park and Copper Sky. The shelters serve the “route deviation” service of COMET, which is a specific route around the city. 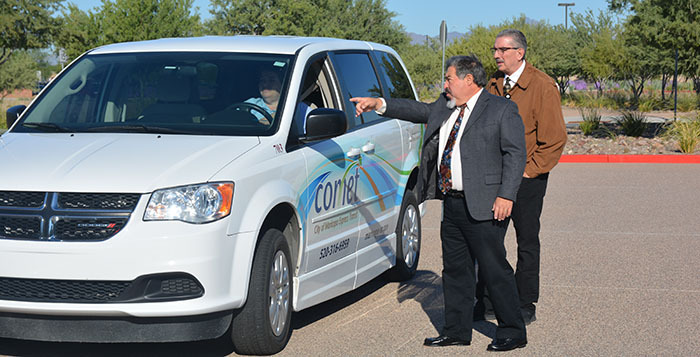 COMET also runs a demand response, dial-a-ride service, which picks up riders wherever they are located and takes them to wherever they need to go. There are also shuttles that take riders to Chandler and Casa Grande. Though the COMET has served the CAC campus for a while, the bus stop was just a post. Now it is at the main entry with seating and shelter. The City operates COMET under the auspices of TotalRide, so drivers like Helena Dobers are employed by both. She drove a school bus, including the summer Copper Sky route, for three years before coming on board COMET full time this year. “And it’s been beautiful,” she said. City Transit Planner David Maestas (center) and TotalRide General Manager Chris Hager talk with COMET driver Helena Dobers.